In today's world of employees spending hours online everyday with multiple devices, Webroot offers a unique portfolio of solutions for protecting endpoints. This consists of three offerings that can be deployed independently or in any combination. When implemented together, they provide far-reaching benefits. 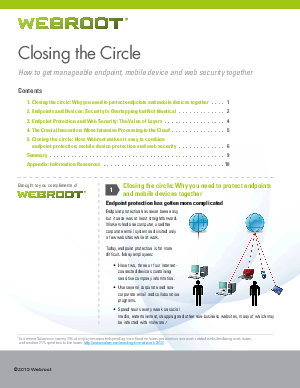 Read this whitepaper and learn how to get manageable endpoint, mobile device and web security together.